Hi, everyone. After a long hiatus from my blog, I’m finally back at it at the halfway marker of the trail. A month is a long time to try to write about without putting together a small novel, so I’ll keep it relatively brief and hit the highlights since my last entry. Here we go. Mileage: Day 36, 13; day 37, 29.3; day 38, zero; day 39, 14; day 40, 14.9; day 41, 3.1; day 42, zero; day 43, zero. The night after my last post, I fell quite sick with what I am assuming was the norovirus. I was achy, I threw up (something I hadn’t done from illness since 2009), and I had relentless diarrhea, the perfect night nightmare for hiking, especially the night before our biggest day yet. It is a testament to the resiliency of the human body that I was able to hike over 29 miles without any fluids and constantly stopping to dig catholes. Also on day 36, Odysseus began his attempt at the 24-24-24 challenge (24 beers in 24 hours over 24 miles), drinking 11 beers in his tent that night to lighten his load for the miles of the challenge. He woke up on day 37 rather hung over and threw in the towel, meaning two-thirds of our team was in rough shape. Some good trail magic came out of it when we left the 13 beers on trail miles from a road, so it wasn’t a total loss. On day 37, Memorial Day, we made it into Damascus around 8 p.m., and I made the call to take a zero the next day, knowing that my dad was coming to join me for a stretch and Damascus was a good spot to join me. So I said goodbye to Odysseus and Big Money, planning to fall behind to hike with my dad and take a few days of family time, but with full intentions of catching up with them. After a needed rest day to restore fluids, dad and I set out from Damascus on day 39. It was a rough stretch for somebody not used to hiking up mountains, but we were able to do 29 of our 32 miles in the first two days, leaving only about three miles for us on the day my grandparents picked us up on day 41. 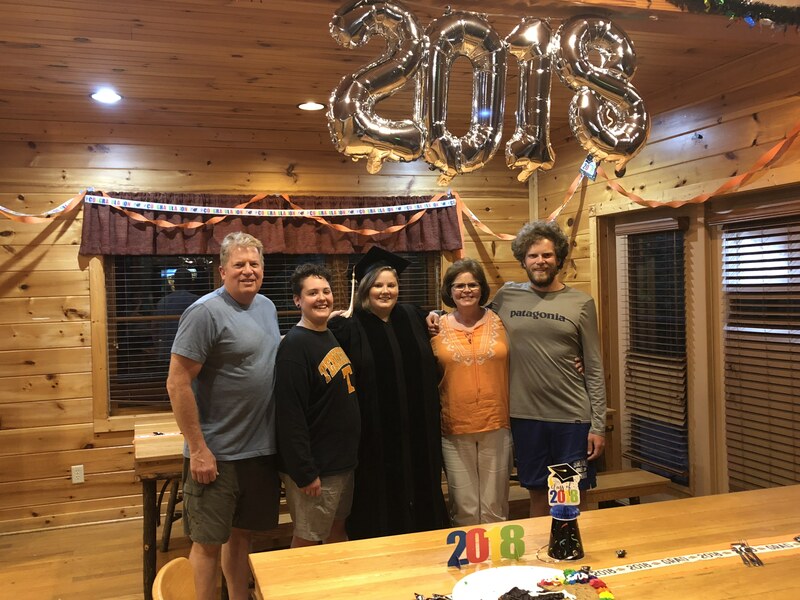 About 20 members of my family were meeting in Gatlinburg to stay in very nice cabin to celebrate my sister’s graduation, so I had a luxurious and relaxing weekend with my family before getting back on trail. Days 42 and 43 were much needed zero days to reset, catch up with family, and eat just about all that I could. Mileage: Day 44, 8.1; day 45, 17.2; day 46, 21.1; day 47, 22.7; day 48, 32.5; day 49, 33.4. 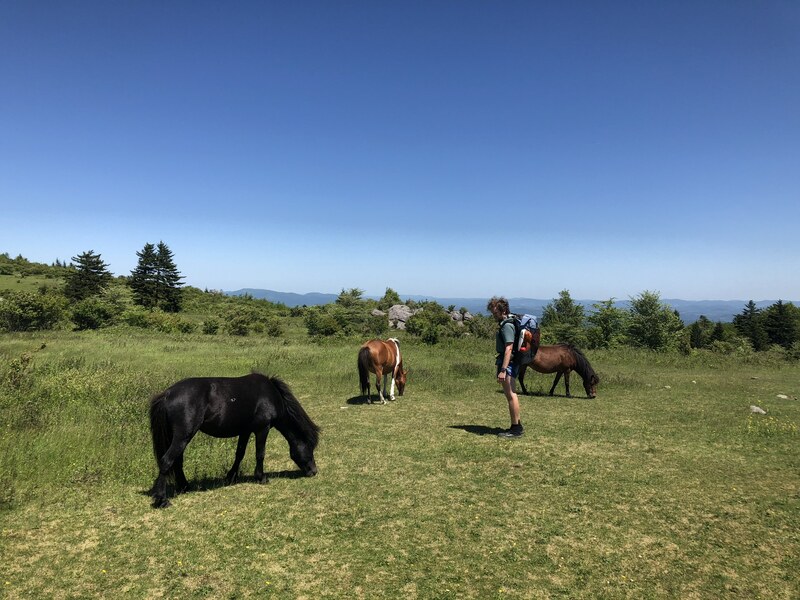 After great rest and a slight gear reset for dad, we were ready to hit the trail again on the first Monday of June, a nice, short day in the Grayson Highlands filled with ponies and beautiful weather. This next 30-mile stretch with my dad was in stark contrast to the first difficult hellacious stretch. The views were breathtaking, the hiking was much more pleasant, and dad and I ended up having much more time to talk so the time went by pleasantly. We were even able to do 17 miles together on day 45 more easily than we did 14 on the first stretch we did together. I am extremely thankful that my dad was able to be a part of my journey, and I was deeply sad to have to say goodbye to him on day 46 after about seven morning miles to the car we had left for ourselves at the Pat Jennings Visitor Center. But, after a resupply and lunch stop in Marion, that part of my journey was over, and I had major miles ahead of me if I was going to catch up to my friends. Even after 14 more miles that day I was still 80 miles behind. After a late night of being stalked by a bear, day 47 started later than any yet on trail. A 10:30 start time set me up for an unimpressive catchup day with only slightly higher than average miles. That night was my first camping completely alone, and I spent it crafting a particularly ambitious plan: I wanted to make it to Pearisburg in just two more days. I was at mile marker 570.6. Pearisburg is 635.4 and a mile off trail. 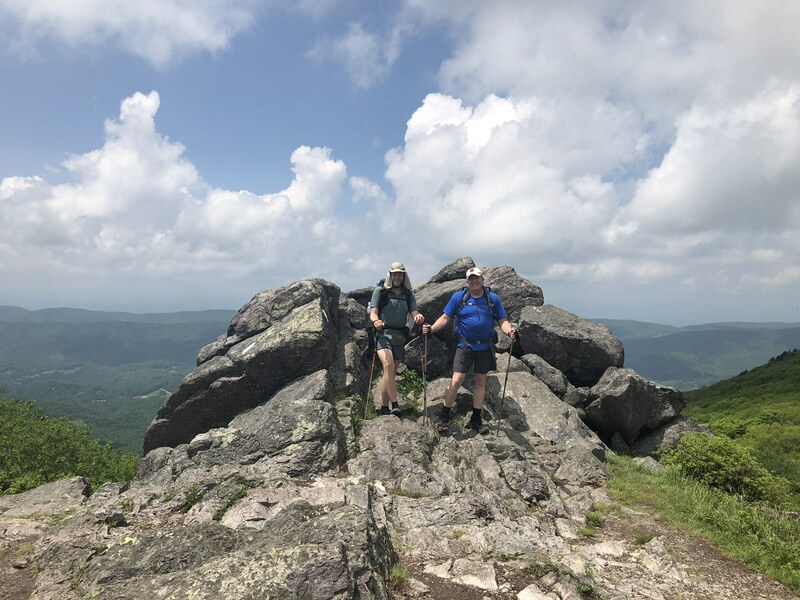 Days 48 and 49 were blurs of fast hiking and few breaks, but 66 miles on my feet later I was relaxing in the MacArthur Inn in Narrows, VA, a short drive from Pearisburg and the only hotel for miles with any room left. My legs were screaming, but I was proud of my feat. Mileage: Day 50, 21.5; day 51, 23.7; day 52, 30; day 53, 18.8; day 54, 23.1; day 55, 28.2; Dsy 56, 27.2. Week eight was workweek. 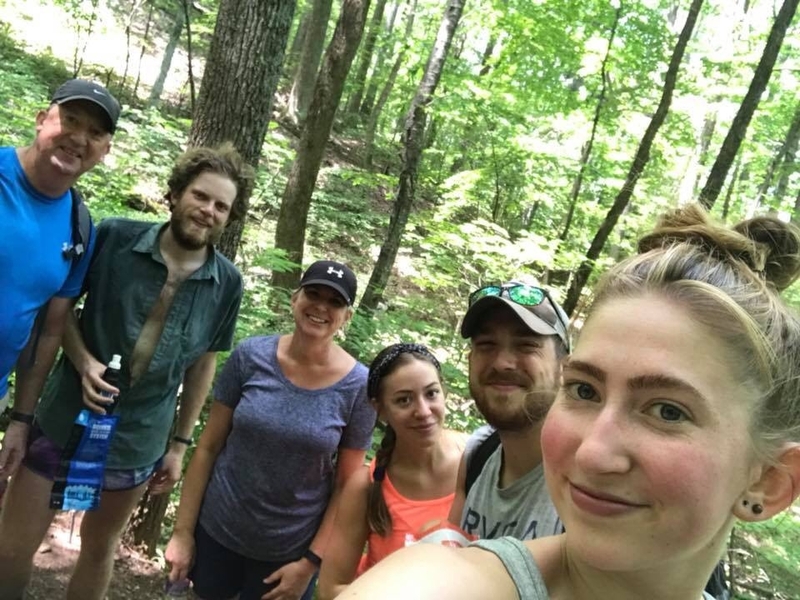 I had set myself up well after a few major-mileage days, but I was still a good ways back from my friends and still had to keep an impressive pace to meet them in time to hike a good bit still before Big Money finished her thru-hike in Harpers Ferry. I did all my town chores on day 50 and then got back on trail around 1 p.m. to squeeze in 20 miles before it got too dark. I just kept pushing miles the next few days, and the mileage I was cranking out each day meant that it was unlikely for me to see people multiple nights in a row. There was a young guy named Bo I met, though, who I hiked with for a few days. He was trying to knock the trail out in a summer between college semesters, so his pace was pretty quick, too. The timing couldn’t have been better, because day 53 was my McAfee Knob day, the spot of the most photographed spot on the AT. 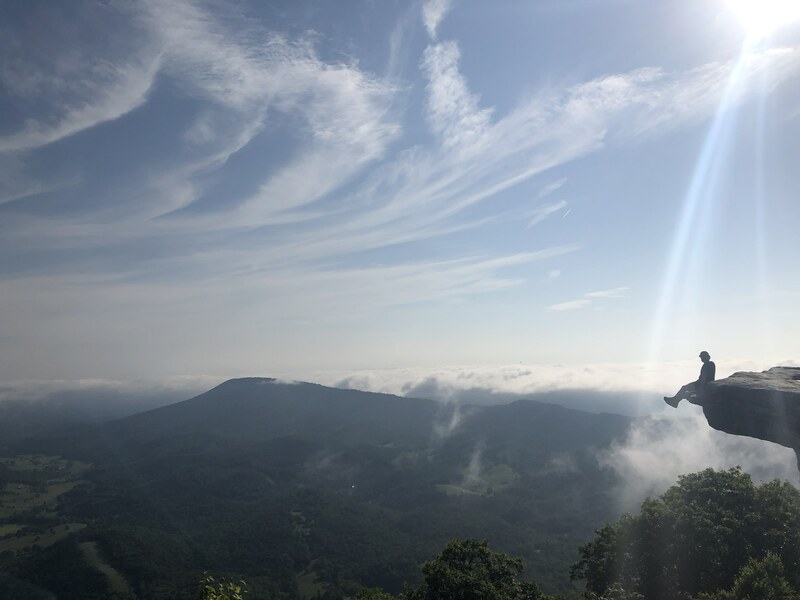 It had been rainy ever since I’d gotten back on trail day 50, but when I hit the knob that morning, I had a beautiful greeting from the sun and a photographer buddy there to capture it. That night I stayed in Daleville, because even after just a few more days since my last hotel my legs were needing substantial rest again. I got my money’s worth with a late checkout on day 54, and my latest start yet (2 p.m.) set me up for a late night, but I still managed to get in my low number quota. I had made an arrangement to meet some relatives on trail that Saturday, day 56, so even though my feet were really killing me, I had major miles ahead of me. Day 55 was my most painful and slow yet, meaning that even at 9 that night I was still miles behind where I wanted to be, leaving me with 16.5 miles still to do before 11 the next morning. I skipped dinner, squeezed in a few hours of sleep, and at 4:30 my headlamp was on and I was hiking again. I made it with plenty of time to spare to the meetup spot and got in my lunch before my Uncle Jeff, Aunt Bev, cousins Emma and Luke, and Luke’s new wife, Sierra, met up to join me hiking for the next seven miles. After a pleasant afternoon of hiking with family and a trip into town for a big meal and resupply, I was only four miles behind my friends. They flew by, and before I knew it, my once wild goal was achieved: I had made up an 80-mile disparity and was back with my tramily. This bridges the gap to Saturday, June 16, mile 808. The stories that lie between 808 and 1,024 are too great to squeeze into this already novel of a blog post, so I will do them justice and wait for the next entry (which should be less than a month away this time). As always, thank you to any and everyone who has stuck with my story up to this point, and stay tuned: the story is hardly halfway through. Greetings! I'm Carl "Professor" Stanfield, and I love backpacking. 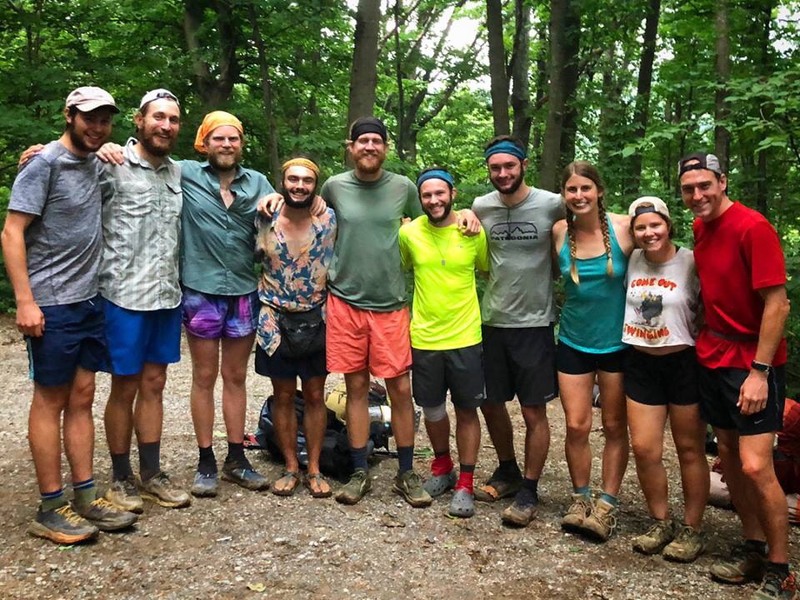 I studied Wilderness Leadership and Experiential Education at Brevard College in North Carolina, then spent about 3 years living and working at camp in Leavenworth, Washington. 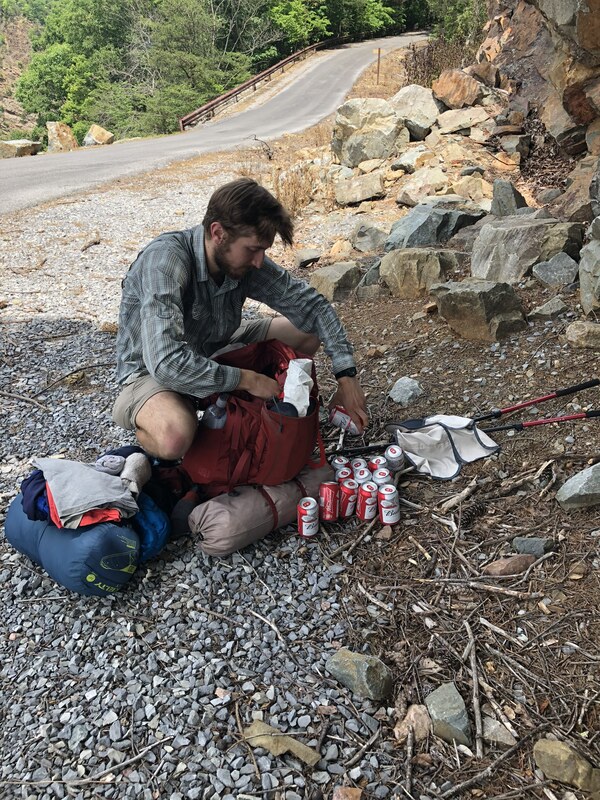 After my time there ended, I decided to attempt a thru hike, and in April 2018, I set out on my adventure on the Appalachian Trail, finishing at the end of August 2018. I fell in love with the wondrous life of thru hiking and have decided to pursue it full time. I plan on taking on the PCT with some friends I made on the AT in 2019! Until then, I'll be working at my local outdoor store to save up for the next adventure.